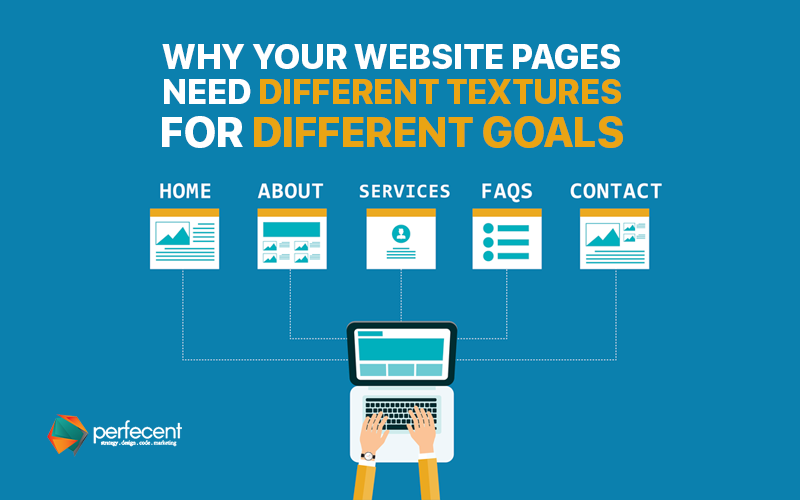 HomeWeb Development Why your Website Pages Need Different Textures For Different Goals? The texture in website designing terminology is the illusion of having real texture in the background of a website which may vary from page to page. The need of texture in designing is to enhance the stylization, prompt the ideology of design and give an overall artistic appeal. Textures are not just a beauty element; they also support designers to highlight important thing in design. Modern website designs do not incorporate textures often but the texture lovers can manipulate design techniques to add their desired element without making them too obvious or highlighted, and this is the actual beauty of dynamic domain of website designing. The use of texture where makes a website appealing and amazing, on the same hand, it can also ruin all the efforts if you didn’t use them smartly. Let’s suppose texture is like a carpet in your home; you select your carpet in a way that it goes with your furniture, space, the theme of the interior, etc. You select a different carpet for kid`s room, main bedroom, lobby or corridors, living area kitchen, etc. And you become super conscious when you but it for drawing room. You never go for the same carpet for all rooms and spaces of your home. In a similar way one texture for all pages in not a good fit because every page has its particular function and clients want to have a different ambiance for different pages as per the functions of various pages. The goal behind placing textures is to transfer the ideology to the clients that why a page and present information is placed on a website. The “home” page is basically a summary of the complete website, so the texture over it should portray the overall idea of business. It must show the enthusiasm and persistence of a company. The flow of design and linkage between all pieces of information on a home page is very necessary to build understanding and keep visitors connected. The “about us” page is less formal, and mostly the content over this page is written in a semi-formal language with interactive style. So, the texture should suit the informal style. A rigid or formal texture is not suitable for it. The “service” page is goal-oriented and formal, the style of presenting content over the service page follows a professional tone. A designer doesn’t have space trying artistic skills over this page because it is necessary to maintain sophistication and professionalism here. The “contact us” or “buy now” page fall in last, and till this page, the customer is mostly convinced by the idea of the company, services and how it will fulfill their need. The pattern over these pages should show the power of fulfillment and energy. For other pages like or subcategories of main pages, a designer must follow the nature of the page before designing and placing a texture.